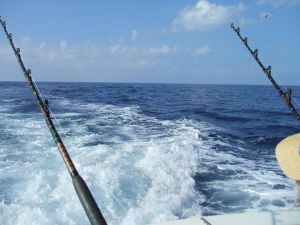 If you crave a day of sport fishing in warm waters, add a fishing charter to your next Costa Rica trip. If you opt to stay at one of our Los Suenos vacation homes, you can spend as many days as you like aboard a fishing boat off Herradura Beach and get a great seafood dinner, too. What kind of marlin can I catch in Costa Rica? Costa Rican waters are filled with a number of remarkable game fish, including at least three varieties of marlin. Your charter captain knows where to find black marlin, blue marlin and striped marlin. Among the most prized game fish in the world, different species of the massive fish tend to run at different times of the year. December through May are prime times for blue marlin, while the black variety tends to school off Herradura Beach in April and May. Each of these species can weigh in at 600 pounds when fully grown. Striped marlin are somewhat smaller and may be reeled in throughout the year at Herradura Beach near our Los Suenos vacation homes. Do I need a license to fish in Costa Rica? Everyone who fishes in Costa Rica needs to have on their person an INCOPESCA license issued by the government. If you book a fishing charter when you reserve your Los Suenos vacation home, be sure to ask whether or not a license is included in the price. Usually, it is. If it is not, you may obtain a fishing license in country or place an online order for a license to fish before you leave home. According to Costa Rican Times, a license to fish costs less than $20 for three days, $30 for a month of fishing, and around $50 for a fishing license that lasts for a period of one year. Kids need a license to fish in Costa Rica, as well. The fishing license laws apply to everyone who fishes, whether they are a tourist or live locally. Where can I get a great fish dinner near Los Suenos vacation homes? When staying in Costa Rica, you’ll find no shortage of excellent eateries that range from simple crab shacks to five-star restaurants. One perennial favorite is El Pelicano. At this well established oceanfront restaurant, one can tuck into a superb seafood dinner featuring local lobsters and flavorful fish. Vegetarian options are always available, too. If you spend a day in the sun and just don’t feel like leaving your vacation rental, you’ll be glad to know that El Pelicano delivers. Like your fish raw? With so much fresh seafood at hand, it’s easy to make great sashimi and sushi. That’s precisely what they do at Ohana Sushi and Tapas Bar on Calle El Hicaco in the quaint beach town of Jaco just a few minutes from Los Suenos vacation homes. This is the place to eat, especially if you think you don’t like sushi. If you truly don’t want to try it, you will find plentiful options on the menu. Call +506 2643 2226 to make reservations, or drop by for a great impromptu meal. Copyright © 2019 Stay In CR. All rights reserved. What Should I Know Before Going To Costa Rica? How To Select The Ideal Accommodation For The Vacations Of Your Life? Why Become A Player In The Los Suenos Real Estate Market?